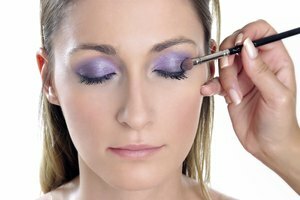 Big eyelids are beautiful, but knowing exactly how to apply makeup to enhance them can be a little confusing. Read below to learn the tricks of the trade. By following these steps, you can learn the best way to apply your eye makeup and let the beauty of your eyes shine through. Shadow. Stick to darker colors to reduce the size of your lids. Try a medium brown on your lids. Add a dark brown, gray or even black to the crease and spread outward, extending slightly past the outer corners. Highlight your brow bone with a light color such as tan, beige or light pink. Highlight with white for a more dramatic look. Line your eyes on top of the shadow in a thick black line with an eye pencil. Smudge the line so that it is not very defined. The thick line will cut the size of your lids slightly. If you feel that your eyes are large in general and you want to make them appear smaller, then line the inner rim on the bottom of your eye with the same black; otherwise, skip lining under your eyes all together. Curl your upper lashes and apply one coat of black mascara. If your eyes in general are average size to small, apply a light coat of mascara to the lower lashes as well. If your eyes in general are large in size, then skip the mascara on the lower lashes. Curling your lashes will open the eyes up and over your eyelids. Keep your eyebrows relatively thick and the arch minimal. If your eyebrows are sparse or over tweezed, fill them in by brushing some shadow in a shade close to your natural brows into sparse areas. For an evening look, apply the same makeup a little heavier and you are ready for a night on the town! Try some eye glitter or sheer eye shadow on the brow bone for a little extra shine! Practice this look when you have time and are not in a hurry to go out.